When you work on a construction or crafts project, you want to put in minimum effort and get the best results. Modern tools and techniques can help you finish your project faster and more efficiently. Manufacturers come up with new technology and tools regularly and as a contractor, you need to identify which tools are worth splurging on and which are simply a waste of money. A pneumatic nail gun is worth every cent you spend on it because it can significantly ease your workload. A pneumatic nail gun sinks nails into wood and other such material at the pull of a trigger. You don’t need to hammer the nail several times for it to sink into the material because the gun will press it in quickly and efficiently. The gun uses air pressure from a compressor to drive the nail into the material.You can save a lot of time, money, and effort if you purchase a nail gun for your toolkit. However, not all nail guns are made equal and some of them aren’t efficient. You need to make sure the gun fires the nail properly and it sinks in smoothly. Poor quality nail guns won’t work smoothly and might increase your workload instead of decreasing it. How to Choose a Pneumatic Nail Gun? There are two types of nailers available in the market and both of them are quite effective. Most people have a personal preference for one or the other. Coil-Style Nailer–This nailer has a connected string of nails that are linked together by a wire. It has a round magazine that stores the nails in a tightly coiled form. As a result, these nailers are quite compact and easily fit into spaces that other nailers can’t reach. The coil-style nailer can also hold more nails so you’re not forced to reload the magazine often. You can sink a lot of nails in one go, which helps you finish your project quicker. Strip-Style Nailer–This nailer is bigger than the coil-style one and doesn’t store as many nails. However, it’s better balanced because the weight of the nails is evenly distributed through the nail gun. You will have an easier time sinking in nails properly if the gun is well-balanced.The strip-style nailer contains a long thin strip that houses the nails. These strips are made from plastic, paper, or wire and hold all the nails in place. The mechanism works smoothly to deliver all of the nails and punch them through the construction material. The two types of nailers are divided into different categories depending on their function and use. Some are designed for large-scale projects and high-volume tasks while others are appropriate for smaller projects and easier tasks. Framing Nailers – These nailers are ideal for big projects like constructing a room, building a deck, building and installing frames for homes, adding new space, etc. Finishing Nailers – These nail guns are for smaller and lighter projects like creating and installing furniture, assembling cabinets, attaching trims and moldings, etc. They are lighter than the framing nailers and therefore more suitable for small projects. .
Staplers and Brad Nailers – These nailers are designed for precision and are lightweight as well. They’re needed to attach smaller and thinner pieces of material. Roofing Nailers – These devices are designed to handle roof shingles. They’re also lightweight and portable so you can use them safely on the roof. Flooring Nailers – These nail guns, as the name suggests, are designed to install hardwood floors. Palm Nailers –These nailers drive individual nails into small spaces and can reach areas that are difficult to access otherwise. These pneumatic nails don’t have added storage so you need to load a nail after every use. Make sure the gun has directional exhaust so you can change the direction of the exhausted air. Purchase tool nailers with depth adjustment. That will allow you to control how deep the tool will drive the nail. Large triggers will make your job easier. Handle the gun and press the trigger to see if it’s comfortable before you purchase. 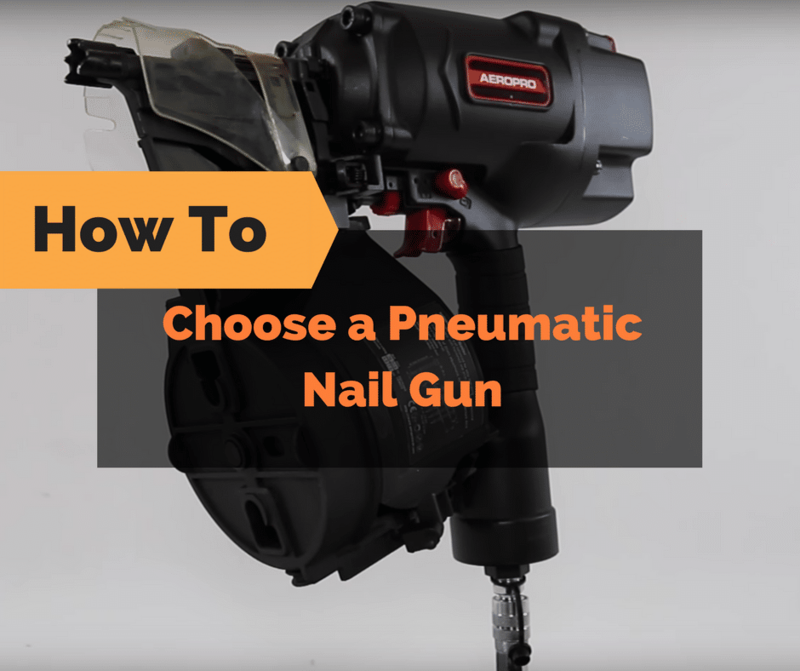 Explore the different options to help you choose the correct pneumatic nail gun to complete your projects quickly and efficiently.